Everyone knows the basic items you will want in your bag when you head to the parks each morning during your Disney vacation. You know the items. Camera, ID, snacks. If you are a seasoned Disney Parks visitor you likely have those random or off the wall items that you have discovered you want to have in the parks. Those are the items that take your vacation from good, to great. Those are the items I am going to share with you today. The first thing I suggest to everyone, that I don’t hear very often is liquid band aid. Most people have heard of mole skin to take for your feet in case you get blisters. Well, we have a few problems with moleskin…well one big one. It comes off when you go on water rides or if you sweat too much. So we have found that liquid band aid (like this one here) are the perfect solution. You put on a layer or two of this and it is water proof and protects the area. Put it on as soon as you feel a “hot spot” for a blister. You can also use it for minor scrapes and cuts so it has a double purpose. It does sting on cuts though. We also like to carry a travel/sample size container of body or baby powder. If you start getting overly sweaty or you go on a water ride, your clothes can start to chafe (girls, especially if you wear underwire bras). It is nice to be able to go into a bathroom, grab some paper towels to dry off where needed and then put on some powder to stop from chaffing. I have had friends thank me tons for this tip. Summer 2014 I took a girls trip to Disneyland for the Type-A Parent Bootcamp Conference and I through in some empty ziploc bags in my purse. I have already talked about 10 reasons to take Ziploc Bags on your vacations HERE, but usually my reasons are more geared towards parents. This time I took an empty gallon size bag folded up in side my purse. Then, when I went on wet rides, I could take it out and put my purse inside the gallon size bag. Super easy way to keep everything dry. This was perfect since nobody was sitting out to hold our stuff, and not all the water rides had lockers near them. Medicines. Okay, so this one is not so off the wall, but a lot of people don’t think about it. Yes, the nurses station has some meds they can give you, and you can buy some other over the counter items on property (though often highly overpriced) but I like to be prepared. I like to take pain killers (headaches happen a lot at the park), allergy meds, digestive aids such as ant-acids, and then any special meds that my family may have. This sounds like a lot to carry but I actually fit all of this, plus a mini first aid kit into a portable wipes container and it takes up hardly any room in my purse. 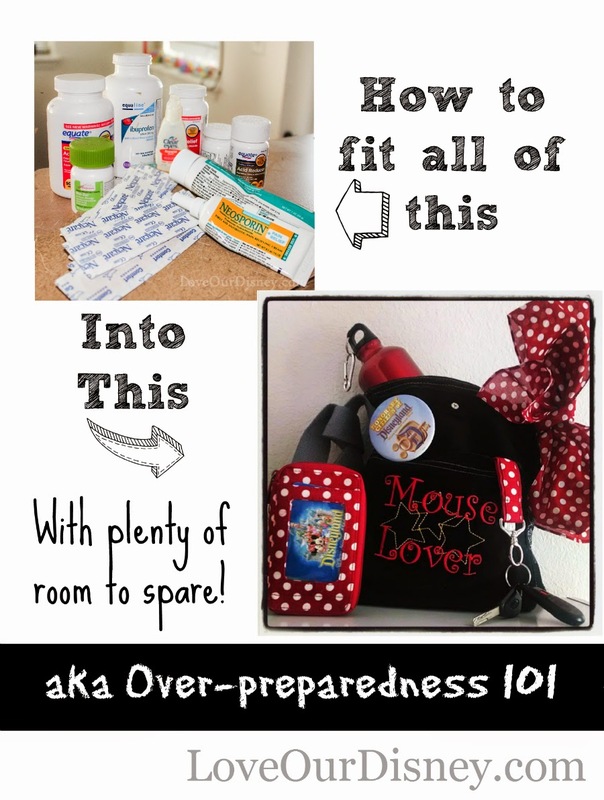 I tell you how I do it HERE but you can make it even smaller by leaving out the first aid items if you want. I always take hair ties with me in the park, even if I already have my hair in them. They can be used for so many emergency situations, and honestly, you can just wear them around your wrist, or throw them in your bag and they take up hardly any room. Have a zipper that keeps falling down- a hair tie can fix that so your zipper is not down in all your photos. We sometimes use hair ties to tie bags from different stores together. If you don’t wear hair ties, rubber bands are also an alternative. I just like hair ties because I already have them with me, and if the one in my hair breaks, I can use them for my hair as well. Sharpie/pen. You never know when this will come in handy. Even if you aren’t planning to get autographs, these are great to have on hand. Also a small pad of paper. If you are given a phone number (to guest relations), or need to remember a cast member’s name you have that stuff with you. If you forget to put a Safety Tat on your kid, a sharpie or pen can work (and the liquid band aid can help it be water proof). Just make sure to let the sharpie/pen dry for a good 30 minutes before applying the liquid band aid. I love reading what random and off the wall items people have found to be useful for their Disney vacations. Do you have one you suggest? Leave a comment below letting me know what it is. 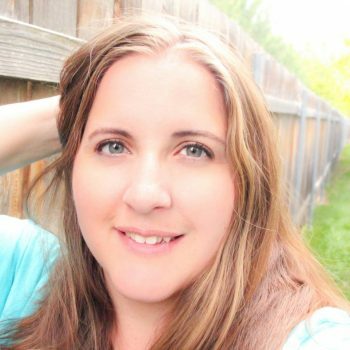 Thank you for joining Magical Blogorail Blue this month. We will be back in next month with all new loops and themes. Keep checking in with our blogs in between loops to keep up to date with newest posts, photos and stories. If you are looking for more Disney magic, you can make your way over to The Magical Blogorail website to see all our members and their blogs, as well as all our previous loops. 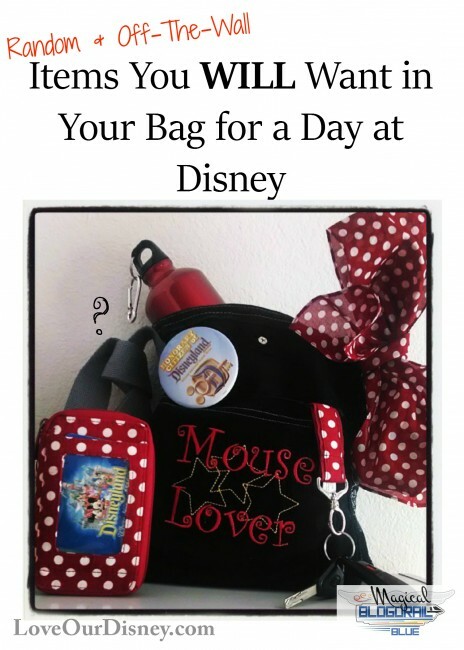 4th Stop – Saving Up for Disney – What’s in my Disney Parks Diaper Bag? You have a FANTASTIC list here! I ditto the liquid bandage, we used this on our trip to Europe and so much better for blisters than anything else. I love the idea of using a giant Ziploc for your purse on water rides, thanks for sharing! I over prepare for everything. But at Disney I just don’t want to carry a large bag. If you need OTC mediations, check out the First Aid station. I have been given Tylenol and Imodium there for my family. I have used first aid, but sometimes, I just don’t want to take the time to go there and get it. 🙂 I found getting a small pill container (round one) and separating different medications into the different days and then using a sharpie to mark what is what makesit so you take up very little space, but have everything right there. Good ideas! I wouldn’t have thought of any of this stuff! Thanks for the tips! I always bring medicine with me too. Just a few doses of basic pain meds for me and my husband, though. My hubby puts a bottle of kids’ medicine in his backpack.